Just a little note to let you know about two pieces of work that I’ve got out and about in the coming weeks. And a project that I’m involved in that may be of interest. 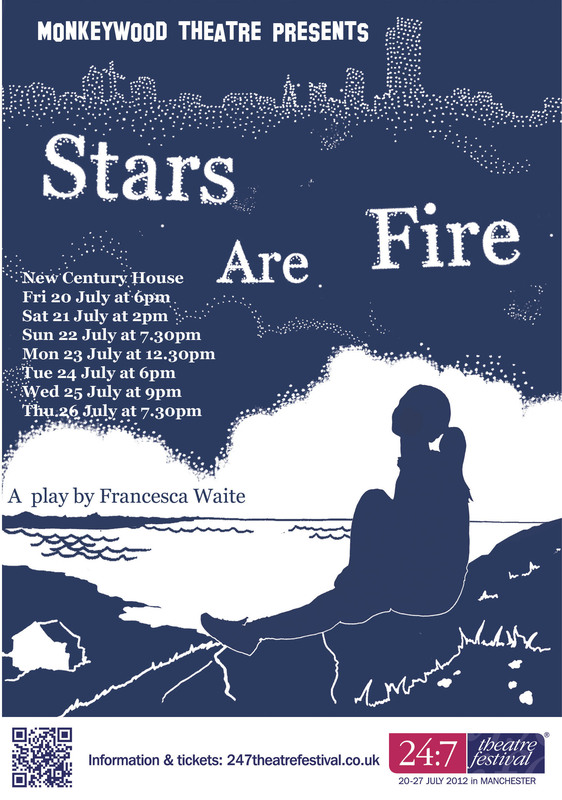 Stars Are Fire is a brand new piece of theatre by Francesa Waite that I’m directing for the wonderful Monkeywood Theatre as part of 24:7 Theatre Festival here in Manchester. The play tells the story of Carly – when her mum dies, her dad decides they need a fresh start ‘back home’ in Northumberland. But her home is Manchester, it’s what she knows and who she is. As she struggles to adjust to their new life she wonders if her dad really knows her at all. To find out more about the show and to book tickets have a look here. I am involved in developing Writing Squad a new project for young writers starting in Manchester in September 2012. We are currently accepting applications from writers aged 16 – 21 who would be interested in taking part. Info about what you need to do to apply is here. That’s all for now. Hope to see you at one of these events soon and if you need any further info about any of them just give me a shout.